QD Vision, Inc. today announced that it was recently awarded a development contract by the Defense Advanced Research Projects Agency (DARPA) to advance their quantum dot-based infrared (IR) materials and deliver two prototype devices. The $900,000 award is for an extensive 12-month research and development effort. Electrovaya Inc. today announced that it has signed a contract to provide a lithium ion Battery Energy Storage System ("BESS") of approximately 1.2MWh for demonstration purposes in support of renewable energy generation in Ontario. KLA-Tencor Corporation announced a critical enabling tool for chip manufacturing at the 20nm device nodes and below: the eDR-7000 electron-beam wafer defect review system. The HzO technology is a unique process that creates a nanoscale coating that protects electronics against damage caused by exposure to fluids, which is the leading cause of lost functionality in electronics. Berkeley Design Automation, Inc., provider of the world's fastest nanometer circuit verification, today announced that Toumaz, the leading provider of ultra-low energy wireless telemetry technologies, has selected the company's AFS Platform for RF block characterization and full-circuit transceiver verification. Avid Nano have issued a new technical note demonstrating the excellent performance of its W130i Dynamic Light Scattering System for detecting and precisely measuring sub-nanometre particles and molecules. In collaboration with Cavendish Laboratory (Department of Physics at the University of Cambridge), Dolomite, a world leader in the design and manufacture of microfluidic solutions, has designed a glass microfluidic device for a novel laser tool that allows the study of mechanical properties of cells using optical stretching on a single cell basis. Altair Nanotechnologies Inc. today announced it has signed a contract with the Hawai'i Natural Energy Institute (HNEI) of the University of Hawai'i at Manoa to supply a one-megawatt ALTI-ESS energy storage system for a test of solar energy integration. Medical history was made in 2011 with the world's first synthetic organ transplant. A terminally ill cancer patient received a new lease on life with the transplant of a synthetic trachea made from a POSS nanocomposite polymer. This novel optical surface profiler mode combines patent-pending hardware and software to enable select models of Bruker's ContourGT 3D Optical Microscopes to break the optical diffraction limit and deliver lateral resolutions that were previously considered impossible to achieve. The symposia will be held on the 5-6th October 2011 in Berlin focusing on applications developments in life sciences. These meetings continue to be highly regarded on the international life sciences meetings calendar. More than 100 scientists from around the world are expected to come to Berlin to discuss their results and share scientific knowledge in a relaxed and informal atmosphere. Anasys Instruments' AFM-IR system has been recognized by Microscopy Today in the receipt of the 2011 Innovation Award. 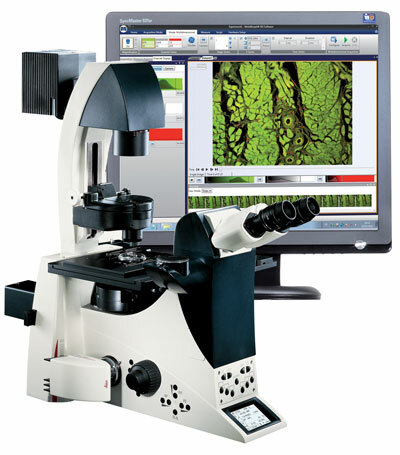 Leica Microsystems and Molecular Devices have launched the next generation of Leica MM AF imaging systems, a product line that combines Leica Microsystems' leading microscopy technology and Molecular Devices' latest MetaMorph NX Software. The NanoCount 25 gives users the ability to set particle detection in four channel sizes: 25, 50, 75 and 100 nanometers. PI's miniature M-810 and M-811 hexapod 6-Axis positioners can now be controlled by an Apple iPad. Bruker today launched the Dimension Edge PSS Atomic Force Microscope (AFM), a production-environment AFM specifically tailored for patterned sapphire substrate (PSS) metrology in high brightness light-emitting diode (HB-LED) manufacturing.